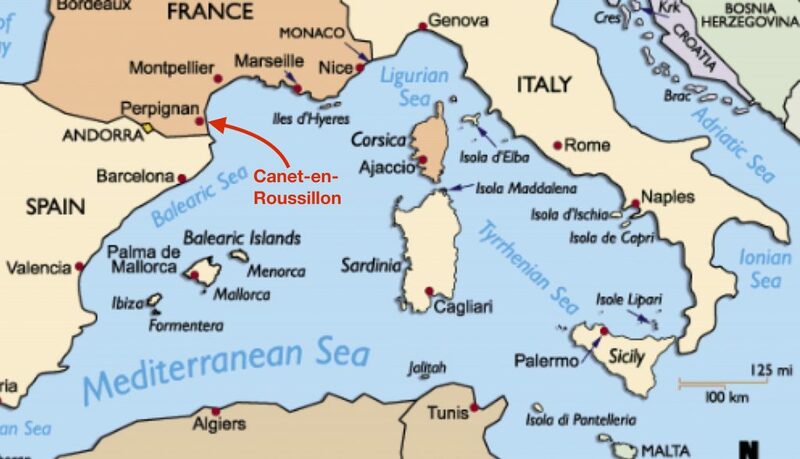 When people think of the French Riviera, I can bet they don’t think of a place like Canet-en-Roussillon. This little coastal hamlet is tucked away in the very southern extreme of France’s Mediterranean coastline, practically on the door step of Spain. Indeed, for awhile it was part of the Catalan region. Canet has its expansive beaches, but it’s devoid of the glitz and glam, the flashy big super yachts, and the well heeled sophisticate of the French Riviera. It’s the summer vacation choice of the everyday French family, and its port facility is where you come to roll up your sleeves and get work done. That criteria met our needs to a tee. After two weeks of driving splendor around the French countryside, it was time for us to ditch the self-guided chateaux audio tours, the wine and cheese tastings, and the extra flaky chocolate croissants. We had plenty of roll-up-the-sleeves items on our task list, items we had been planning for since we rang the bell on our new boat purchase back in October at the Annapolis Boat Show. Our broker and friend, Steve from Navy Point Yacht Sales in Sackets Harbor, New York, had flown in to help us through the commissioning of our new floating home. He had also brought his business partner and tech extraordinaire, Peter, to lend a hand. The running joke was that Peter brought more tools and spare parts than clothing. When he pulled out his tool bag and power drills, there was no doubt in my mind this was the truth! Thanks to Steve, we started out the first evening onboard sans power tools, and instead popped the cork on a nice bottle of champagne that we enjoyed alongside charcuterie. We were officially celebrating the hand over of Sea Rose. She had been detailed earlier in the day, and I couldn’t get it out of my mind that this was probably going to be the nicest she will ever look! Like the feeling you get when you buy a new car, we were tip-toeing around above and below decks, trying not to drop anything on the nice new cushions, or to track dirt on her gleaming white decks. We returned back to our hotel in neighboring Perpignan with a mix of excitement and a “holy cow what have we gotten ourselves into” feeling! 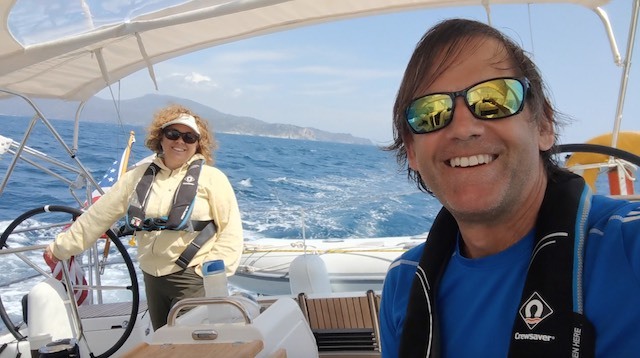 The next three days on the dock were a whirlwind of going through the many onboard systems, testing out electronics, calls back to the Jeanneau factory for questions, and the inevitable documenting of a few warranty items. The Sun Odyssey 440 is a new model from Jeanneau – we were hull number 40 – and as with anything new, there are always a few kinks that need to be worked out. 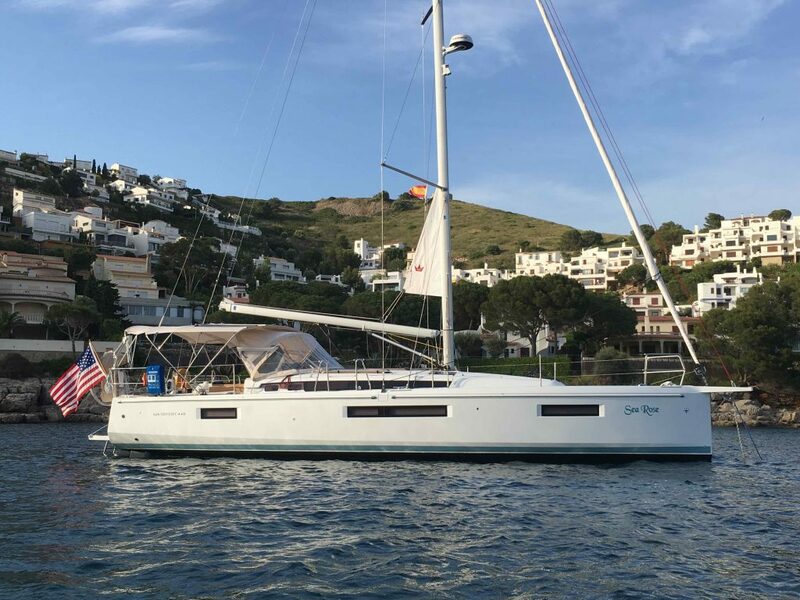 We had also requested the commissioning yard – Sailing Atlantic Services – to make several upgrades, including solar panels on the bimini and dinghy davits on the stern. There was now a hefty list of items for SAS to look into, which they did with speedy attention. We had our first sea trial, as we headed out into the large Golfe du Lion under light breezes to raise sails, including our new Code 0. Steve and Peter also spent a full morning with us practicing docking and maneuvering, with Karen at the wheel. This was priceless experience, as the 440 has a few different hull features, including twin rudders, that make it easier in some ways and requires paying close attention at other times. We would be doing a lot of Med mooring this summer, whereby you back the boat into a dock, usually sandwiched tightly between other boats stern-to, so boat handling skills were going to be a top necessity. Arriving to the boat on the second day, after an overnight rain, we expected to find the boat clean as a whistle, but in fact there was splotches of dirt all over her decks. At home I would have associated this with pollen in the air, but in fact it was very find grains of sand from the Sahara. It seems that when storms come up from the south, they bring the sand from the Sahara and drop it with the rain. Clearly we were not in Kansas anymore. So much for a fresh water rinse! 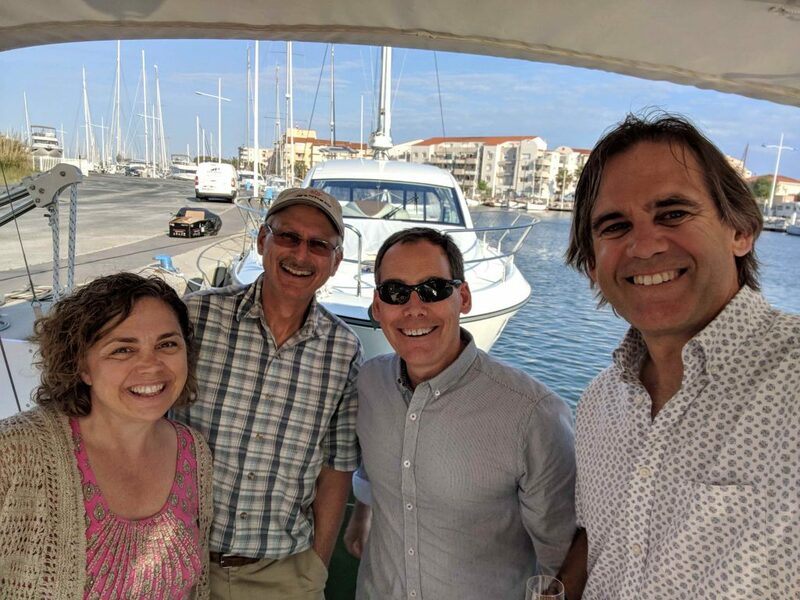 By the third day, we had gone through most of the boat with Steve and Peter, and it was time to bid them adieu while we started unpacking the 23 various sized boxes we had shipped from home three months ago. This was work only Karen and I could do, and it would allow us to finally move out of our hotel and onboard. We have sailed for a long time together, and had our previous boat Thalia setup exactly the way we wanted it to be for long-distance cruising. 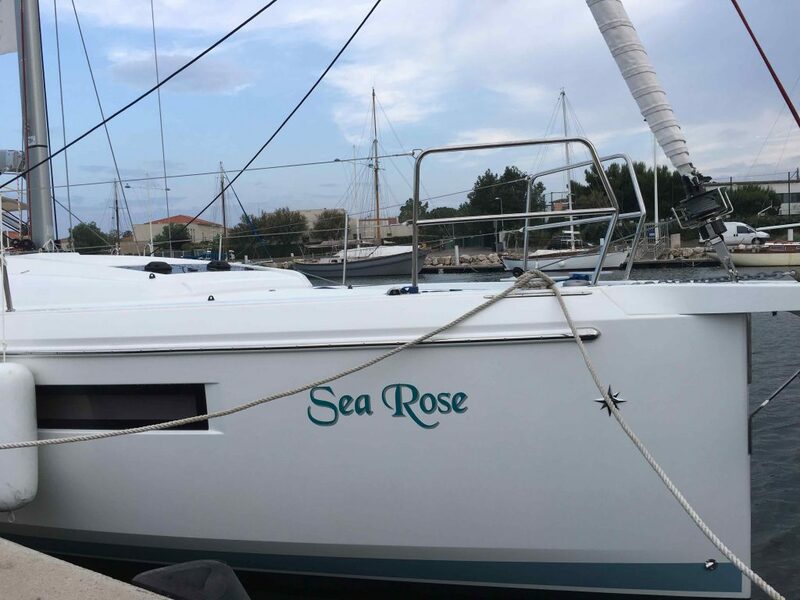 So when it came time to buy our new boat, we pulled several pieces of gear off the old boat and bought plenty more new gear to setup Sea Rose the way we she needed to be. Still, there was a bit of guess work involved, as the two boats are laid out very differently, and we had made modifications to Thalia over many years of use, whereas we had only stepped onboard a 440 at the boat show for one day, having to rely instead on a couple pictures we took of her, and the Jeanneau marketing literature. 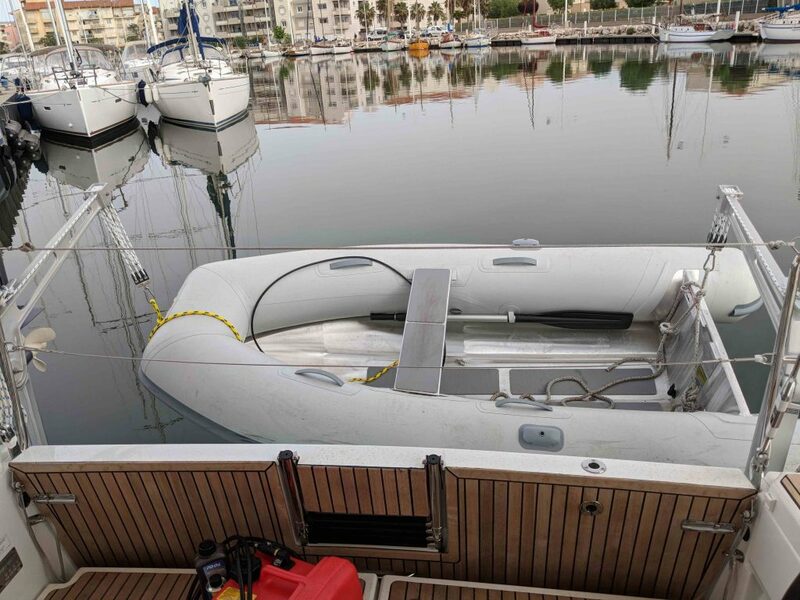 Our biggest item to ship to Canet was a lightweight aluminum dinghy and our equally svelte 15hp Yamaha outboard engine. Often referred to as the family car, having a good dinghy setup is critical to cruising. From getting to the right snorkeling spot, exploring remote coastlines, or running groceries out to the boat, you need a solid dinghy and strong engine for the task. With Karen and I shifted to mostly couple-sailing, with occasional guests, it was important that we had a dinghy that could be lifted and moved around easily. Our new dinghy was now inflated and launched, and the outboard mounted and test run. Finally, it was lifted on to its new home on the stern davits. Success on all fronts! In between our unpacking, workers from SAS stopped by to finish up projects and answer our questions. 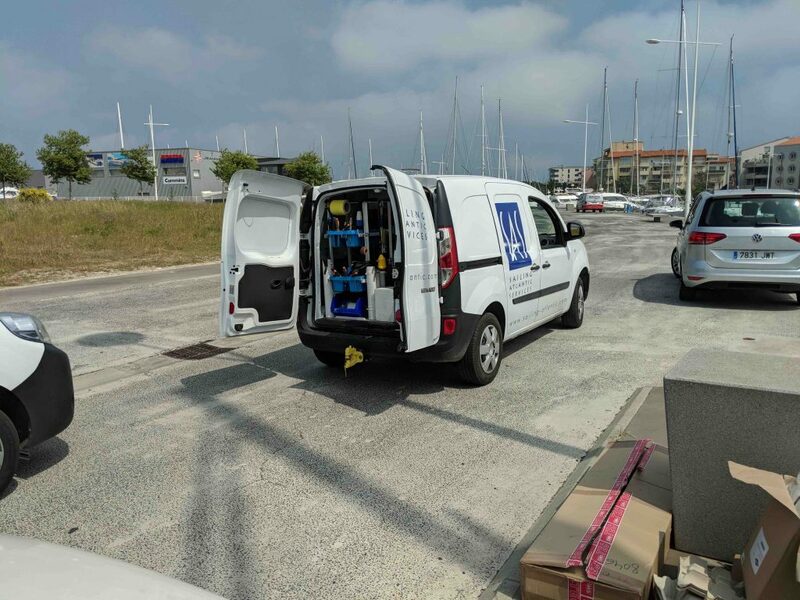 They each worked out of these small white work vans, and when the rear doors were swung open, they revealed a mobile workshop with tools a-plenty. I liked this style of work. So many times back in New England, we’d be at a marina and the yard workers would walk down the dock with a single tool bag. Inevitably a part was needed up at the warehouse, and a lot of lost time (and money) was incurred. Instead, these guys at SAS had most of what they needed in their work vans, and had the competence to handle most any issue that arose. 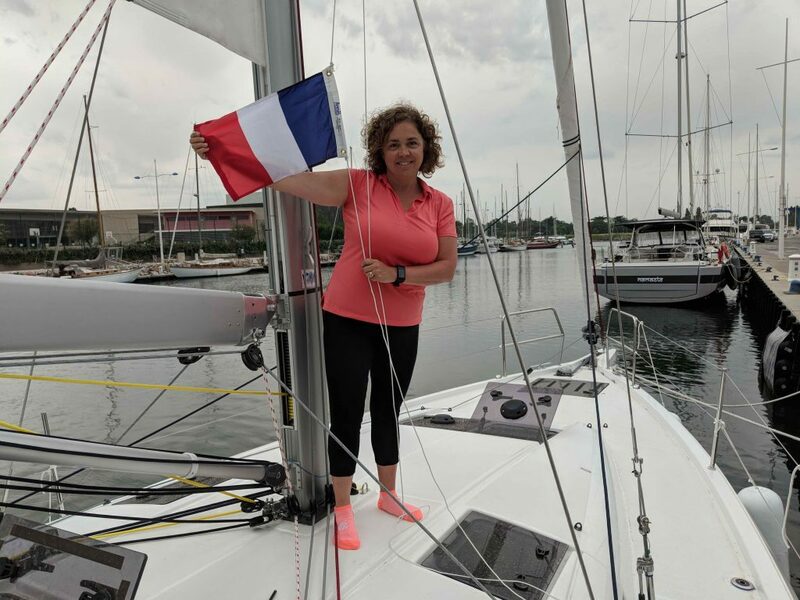 I had heard many stories about how big a part of French life sailing and boats are, and now it was becoming quite clear to us. In the addition to the shipment of gear by containership, Karen and I had maxed out our luggage allowance on our flight to Paris, and had been lugging around 4 heavy duffels of boat gear during our drive around France. It was good to offload this gear on to the boat. We continued unpacking the many boxes of clothing and safety gear, some electronics, camera and drone gear, lots of lines of various sizes, and our special Bulwagga anchor. At one point, seeing all of the boxes on the dock side, we had mutual fears that it wouldn’t all fit on the boat! We knew every nook and cranny onboard Thalia, but on Sea Rose, the storage was different and at first seemed quite limiting. Eventually we discovered some hidden gems of space. 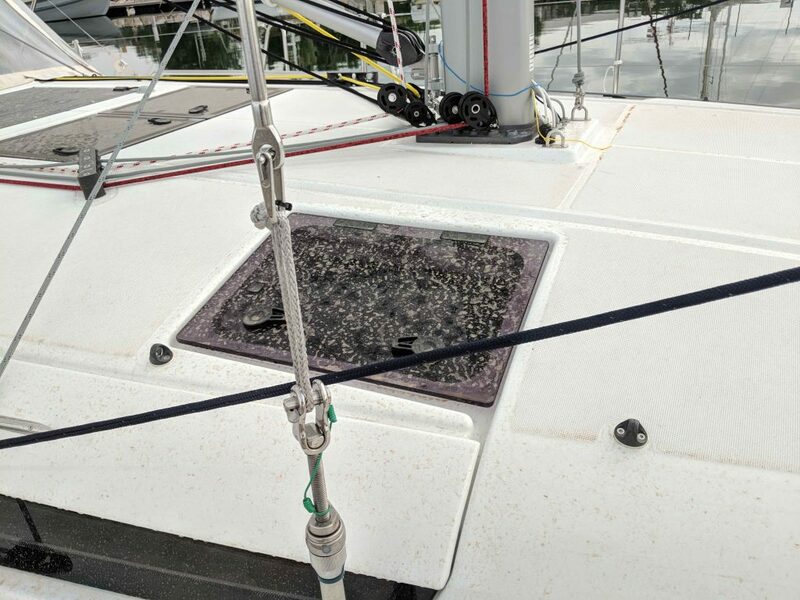 On our last day at the dock, I was excited beyond belief as I discovered several pockets of space under our forward berth for the remainder of our gear – cheap thrills for sure! 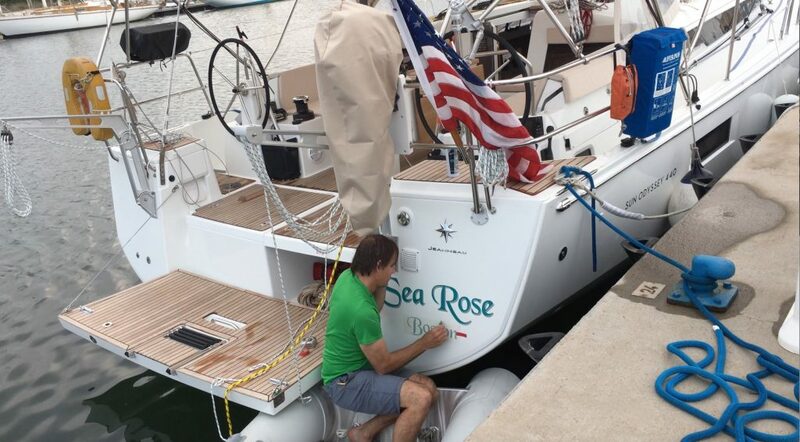 On the last evening at the dock, we made time to put the lettering on the boat. We couldn’t head out on our summer cruise with a generic boat. She needed to be claimed. And so it was, Sea Rose, from Boston. And, of course, we had to raise the French courtesy flag, to be official. There is a certain unmistakeable comfort of being on a dock. That’s why most boats you see at a marina rarely leave. There are lots of nicknames for this scenario – slip queen, gin palace, etc. – but I totally understood where these people come from. Here we were, after 8 months of planning and hard work, and I had some jitters about leaving. There were so many reasons to be excited about our imminent departure and our summer full of destinations. But at the same time, nothing was familiar – a new boat, in new waters, where we didn’t speak the language, sailing to unknown places. Part of me longed for the familiarity of Thalia. She was like an old shoe that fit just right. We knew just what to expect from her and how she would respond. Even when you are at the altar, in front of all your friends and family, it’s still reasonable to have a few fears and misgivings right?! A good friend once told me that it’s important to embrace the fear. It is there for a reason. Recognize it, don’t quash it, and learn from it. 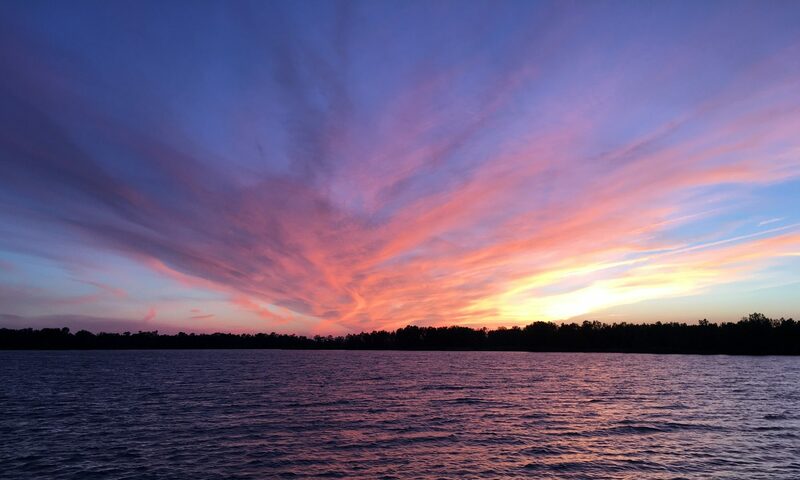 So with a lot of excitement (and a measure of healthy fear) we pointed the bow of Sea Rose out of the harbor on May 29th at first light, and steered her south to Spain. Our first challenge came right at the harbor entrance. It seemed that although no one else was up and about in the marina, there was a dredging crew hard at work at the narrowest part of the entrance. These dredges are a conglomerate of floating debris on the water, starting with the big noisy work barge and its boring drill, plus all of the floating pipes for the dredge spoils snaking their way to the shore. There appeared to be no way for us to get around the beast until we got right up close and noticed they were moving out of the way slightly for us to pass. Phew, challenge #1 out of the way! 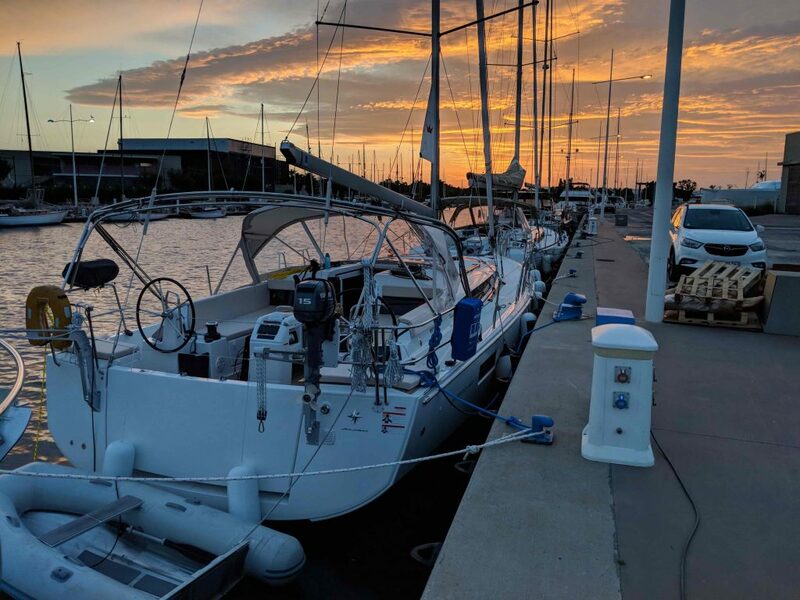 Canet is about 15 miles from the Spanish border, and as we planned out our first day, we looked at several anchorage options to chose from depending on what Mother Nature dealt us for weather. 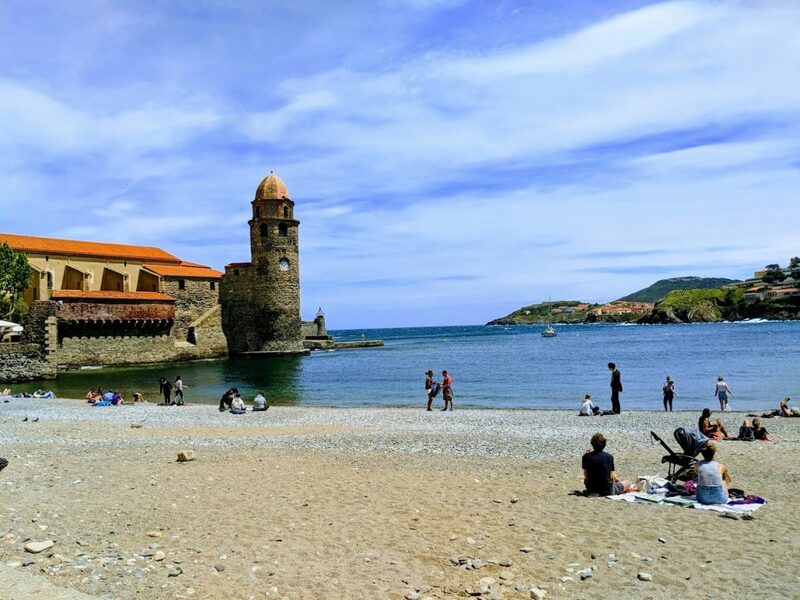 The first was the charming little town of Collioure that we had visited by car a couple weeks earlier. The pilot book was unclear whether you could anchor in the harbor, and the micro-sized marina was fit only for small skiffs, not cruising sailboats. It became clear soon after that the weather was going to cooperate so we set our sights further down the coast. This northern coast of Spain is referred to as the Costa Brava. It’s a completely different landscape than the level plains of the Languedoc region of France where Canet resides. 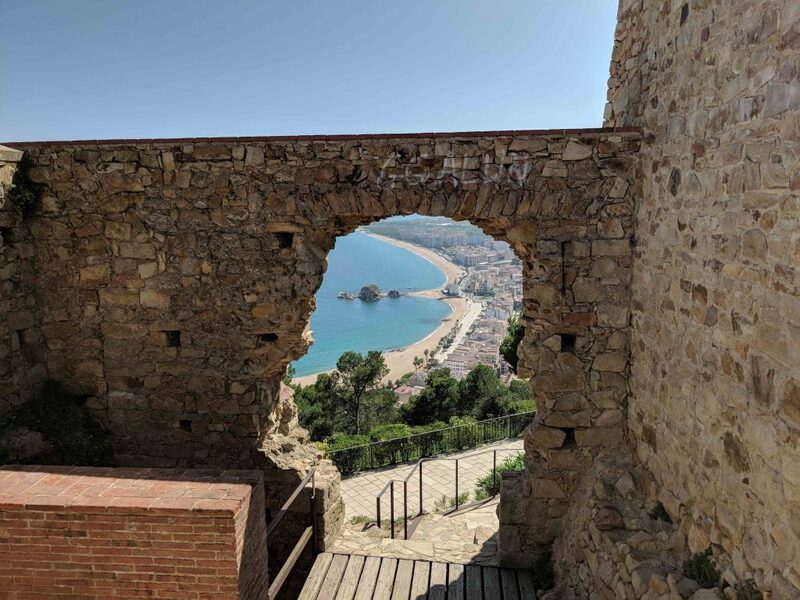 It makes complete sense when you look further into the interior, as the steep Pyrenees mountain range looms large over northern Spain, and it’s jagged lines seem to carry on right down to the Mediterranean coast. We pushed on past prominent headlands that the pilot book warned us could be tricky to navigate, but on this day were docile street corners as we sailed Sea Rose under them in a lightly building breeze. How fantastic it felt to be underway, and sailing nonetheless! We rounded the Cap Creus point and entered the expansive Golf du Roses, with the Port de Roses at its northern end. I had no idea what might exist there, but by sheer name alone, it was tempting to stop and check it out. But we had time still in the day and more enchanting sightseeing along the coast won out. 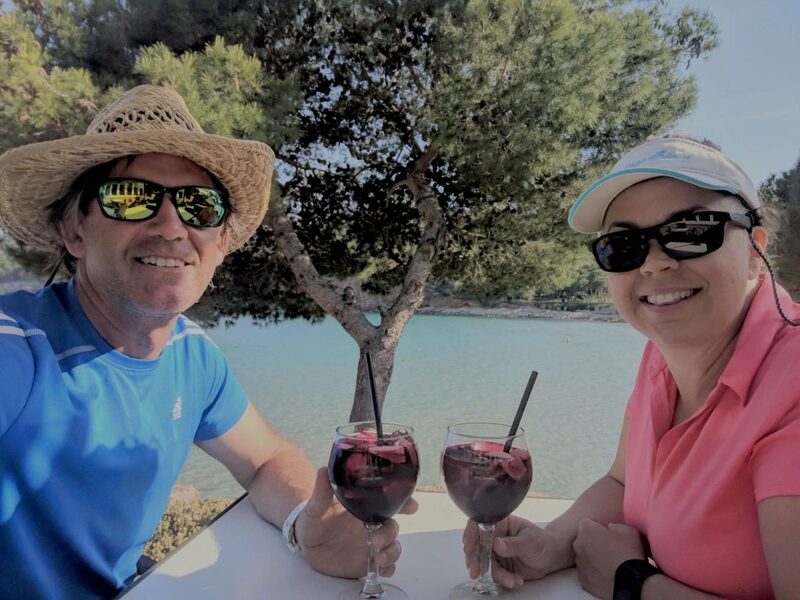 We continued across the Golf to Cala Montgo, one of the more well protected coves in the area, and the perfect place for us to drop our anchor and realize the progress we had made – 41 miles on our first day! Actually setting the anchor on this new boat would take some time to perfect and for us to build confidence in the new gear. Would the windlass work properly? Was the anchor chain sized appropriately? Would our trusty anchor that had served us so well back home work here? I had always found that the first few nights you spend onboard anchored each season are the most restless. You have to get back in the mode of trusting your decisions on where to anchor, and trusting the gear that you use. Trust here, like anywhere else, simply takes time. In these Spanish waters, you run into the word ‘cala’ constantly. It translates as ‘cove’ so it makes sense that it’s scattered all across the charts. Here at Cala Montgo, we found a sleepy little beach community, with families playing in the sand, a cluster of summer villas rising up the headlands overlooking the cala, and a few stores for the odds and ends that one needs when taking a beach vacation. We were close enough to the beach that we could row ashore, and we quickly found a restaurant with an open air deck overlooking Sea Rose that was serving sangria. What’s not to love about a pitcher of sangria and taking in new sights in a new country after sailing your first day on a new boat? Our plans for the summer might just pan out after all! And how about that pretty girl in the harbor, flying the American flag! Thankfully, sleep came easily on this first night anchored out, and we got underway the next morning to put more miles under our keel. Although we had just left Canet, we were trying to make our way briskly to Mallorca for the pending arrival of our two sons, Zack and Caleb. The stars of family life had aligned such that both of them were available to travel to see us on the same week in early June. If you are a parent of post-high school children, you realize how precious few chances you get – with school, and jobs and geographic barriers – to have a true family vacation. So we were going to do whatever was humanly possible to make this rare family event happen. Mallorca is a part of the Balearic Islands of Spain, about 100 miles offshore. 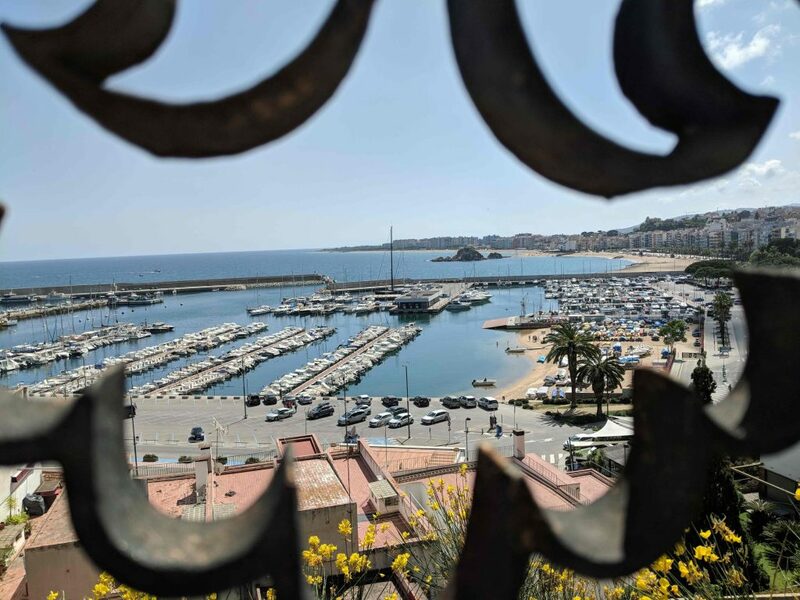 We had a target in mind of the port of Blanes, just north of Barcelona, as a good spring board for our crossing to Mallorca. 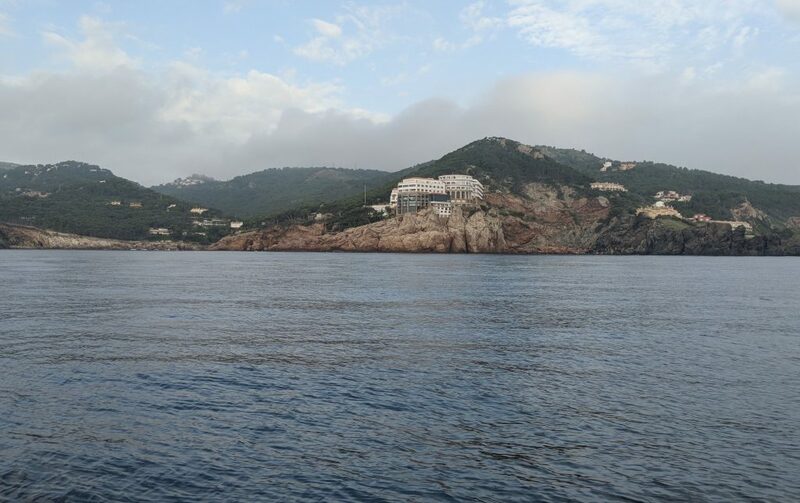 On the way down the Costa Brava to Blanes, the rugged coastline surprisedly still supports a hefty population of resort hotels, some clinging to the cliff edges, defying physics and the concept of easy construction. But as much as we were surprised by these resort complexes, I understood that we were seeing the preferred coastline of Spain. The rumors were that high rise condo and resort hotels littered the coastline of Spain further south. On our arrival outside the port entrance to Blanes, I called the marina on the VHF radio to let them know we wanted to stay for the night. To my surprise, they answered back in Spanish and I was at a loss on how to respond. Thankfully, once we motored inside of the two story high breakwater and entered the calm marina waters, we spotted a guy on a scooter waving frantically and motioning us to proceed to the visitor dock. Five minutes later, and with Karen’s new found mastering of backing Sea Rose into razor tight dock spaces, we had all of our lines secured, the engine off, and were settled. Day two under our belts! Through broken English, the dock attendant apologized that the other staff were on siesta. This would be our first reminder that so much of life here is interrupted in the early afternoon due to the siesta. And it was making sense, as the searing mid-afternoon heat, doubling back at us from all the concrete in the marina, was making us shrivel up like raisins. Checking in at the marina office, with it’s ample supply of air-conditioned sweet air, made me want to settle in for the night on their welcome couch, but my related attempt at humor with the office workers was apparently lost in translation. Despite being located at the southern end of the Costa Brava, Blanes still has some charm to it. Towering over the marina was a hill with an old chapel and fort at its summit, the Castillo de San Juan. We hiked the steep roads to the top to find that this high land was also a preferred spot for a cell tower. I sure hope that the Castillo continues to last and that future generations can remember this spot for more than a great place to update their Facebook status! Back down at the waterfront, we were transfixed by the endless line of beachfront restaurants. Remembering the special first-day-in-Spain sangria of yesterday, we settled into a table ordering paella and pitcher of the fruity concoction. I’m no expert in paella, but when they tell you it is going to take 30 minutes and minimum of 2 orders, it’s gonna be good. When the paella arrives at your table in 5 minutes, like it did for us this day, you’re gonna have to order another pitcher of sangria! Our plan was to leave very early tomorrow morning for the 100+ mile crossing to Mallorca, so it was early to bed for us in this quiet, pre-peak season marina. We had successfully escaped the clutches of the dock and had sailed down the attractive Costa Brava of Spain. More fear and excitement lay before us, but this initiation to sailing in the Mediterranean had gone better than we could have hoped for. Watch out Mallorca, here we come! Who are you and what have you done with Tommy G? The real Tommy G wears white sunglasses, not boring black ones, and sails from his wee hut. I’m sorry but the white sunglasses bit the dust awhile back and all inventory online was exhausted a couple years back. Maybe it’s time for a new trend?! Bon Voyage and happy sailing. Looking forward to following your adventures on the Sea Rose. Thank you Nancy, we appreciate it! Absolutely wonderful seeing the pictures and reading about your maiden voyage, we are sure you will put many happy miles under her keel. Will keep following your adventures ! Thanks Stan and Jackie. Miles under the keel are bound to bring happiness any way you look at it! Way back in 1956 I went with my parents to Sitges for a holiday. It’s just south of Barcelona (wonderful city). At that time Sitges, though a tourist destination still had an acttive fishing fleet . There was no harbor, the fishing boats were hauled up on the beach on rollers. Went back to Sitges two more times with parents and family. There was very little tourist infrasturcture, no high rises etc. Now I hear it is a solid line of high rise hotels, condos etc. Interesting story Martin. It seems it is hard to stop the forward progress of tourism, sometimes done in a thoughtful way, other times , not so. Maybe if we all keep eating fish regularly, it will keep the fishermen and women in business and enable them to maintain a foothold in these harbors! Take care. Hey cousins! Tim just sent me the link to your blog! Excited to get caught up! You guys are amazing! Safe travels to you! Thanks very much Lori! Great to have you a part of our blog. Hope your summer is going well!